Sometimes when I’m researching an item I’ve bought to resell, I stumble on something that CALLS to me. You’ve probably had that happen too. That siren call. 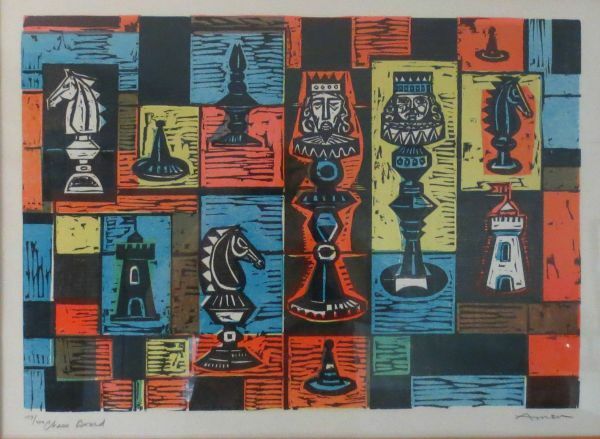 Such was the case for a chess board woodcut print by artist Irving Amen (circa 1960s/70s). I had no idea why I liked it so much, but I thought it was fabulous. So I put the print in my eBay watch list and every once in a while I’d take a look at it. I even researched the print to see if the price they had listed was reasonable and it was. Months later the print was still unsold and they dropped the price. Oh jeez. What to do…what to do? Well, I took the plunge and bought it and was not disappointed. I had to buy them. While the print and quilt squares are different mediums and designs, I think the folk art quality of each would be complementary. Maybe. Gosh, what do I know? But it appeals to me. The listing was for nine squares in two slightly different variations. I only need two squares so I’ll sell the ones I don’t use. I taped two of these squares on the wall to see how they would look. I love these kind of serendipitous finds. Don’t you?! My next step is decide which two to use and to keep an eye out at Goodwill for the perfect (and cheap!) frames for these. 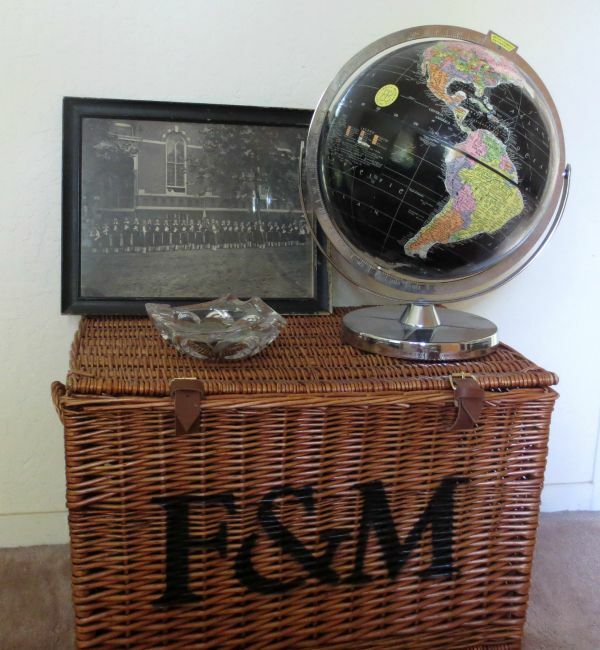 I recently took a Fortnum and Mason wicker trunk (given to me by my friend Lisa), a vintage thrifted globe, a very old school military school photo and a vintage estate-sale-find cigar ashtray that I filled with foreign coins to create this display. Nothing cost a lot, but I like the mix of elements and it adds a bit of intrigue against a boring wall. And it’s also a reminder of past travels and of loved ones who live far away. By rearranging and mixing up things I create new visual interest in a room. Our living room mantel and picture rails are always evolving. It’s not that I spend a lot of time thinking about it or planning the changes. It’s just that I work mostly from home now so when I’m taking a break from my laptop I’ll move stuff around. I’ll put some things away and pull others out to make my work environment more interesting. 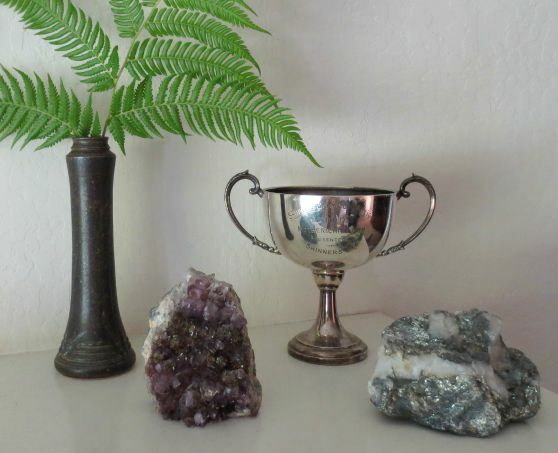 Here’s part of our mantel…a couple of rocks, an old sterling silver trophy and a bud vase with a bit of fern. Nothing special and yet I like it. In a few weeks it will look different. 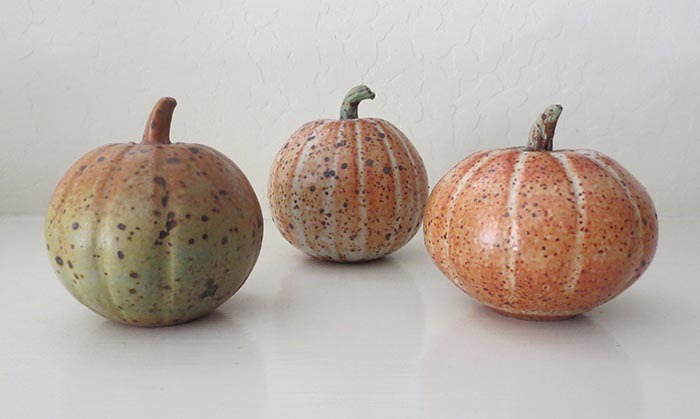 I’ll probably put out my favorite artisan-made ceramic pumpkins and a few old brass candlesticks and books. Or…?? Would love to hear about your serendipitous decorating and finds…and, as always, happy hunting.